Sporting a burnished image after the rescue of 33 trapped miners, Chilean President Sebastian Pinera arrived in England on the weekend. Sebastian Pinera is your Connector of the Day. 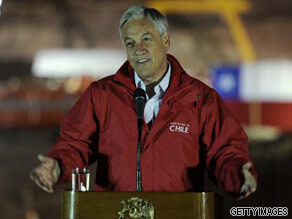 Here's your chance to have your questions answered by Chilean president Sebastian Pinera. Please leave your questions below and be sure to tell us where you're writing from.